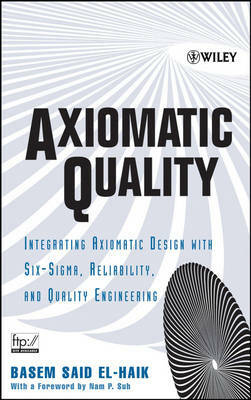 This is the first book to integrate axiomatic design and robust design for a comprehensive quality approach. As the adoption of quality methods grows across various industries, its implementation is challenged by situations where statistical tools are inadequate, yet the earlier a proactive quality system is introduced into a given process, the greater the payback these methods will yield. "Axiomatic Quality" brings together two well-established theories, axiomatic design and robust design, to eliminate or reduce both conceptual and operational weaknesses. Providing a complete framework for immediate implementation, this book guides design teams in producing systems that operate at high-quality levels for each of their design requirements. And it shows the way towards achieving the Six-Sigma target - six times the standard deviation contained between the target and each side of the specification limits - for each requirement.This book develops an aggressive axiomatic quality approach that: provides the tools to reduce conceptual weaknesses of systems using a framework called the conceptual design for capability; reduces operational weaknesses of systems in terms of quality losses and control costs; and, uses mathematical relationships to bridge the gap between science-based engineering and quality methods. Acclaro DFSS Light, a Java-based software package that implements axiomatic design processes, is available for download from a Wiley ftp site. Acclaro DFSS Light is a software product of Axiomatic Design Solutions, Inc. Laying out a comprehensive approach while working through each aspect of its implementation, "Axiomatic Quality" is an essential resource for managers, engineers, and other professionals who want to successfully deploy the most advanced methodology to tackle system weaknesses and improve quality.